I’ve been staring at my chunky old Animas Vibe with its holes in the coating and an interface from the ‘90s, thinking about how I will possibly be able to while away another two years before its warranty is up. I’ve been dreaming up scenarios in my mind where new pump options would arrive on our shores and be rolled out to existing Animas customers sooner rather than later. But I never, ever, really imagined that I would have one of these exciting new options in my hands so soon. (This is the part where I tell you that Ypsomed Australia provided me with a YpsoPump and consumables to take home and trial. Followed by the part where I tell you that was no expectation that I would write, or even trial the pump itself. Followed by the part where I remind you that there’s a bias in place and that you should take my enthusiasm with a grain of salt). I’ve been YpsoPumping for almost four weeks, and I am absolutely loving how sleek and light it is. When I started pumping insulin two years ago, I wanted it purely for the benefit on my blood sugars. I never thought that this sleekness was something that I could ever ask for, or want, in a pump. It weighs eighty three grams, inclusive of a AAA alkaline battery and filled insulin cartridge. To put that into perspective, It’s about half the size of my wallet and a third of the size of my iPhone. Did I mention that it’s slimmer, too? I hardly notice it in my pocket when I’m lounging on the couch or in bed at night. It’s also way quieter than my late Animas Vibe. I no longer hear the swish of insulin boluses being delivered. Or that little ‘tick’ every three minutes as the pump infuses basal insulin into my body. The interface is made of up of predominantly symbols and numbers, rather than words, which definitely took some getting used to. It also has a touch screen, which can only be switched on by pressing the button on the side of the pump. The main menu also has a three tap access code before you can go in and administer insulin. Basal rates can be set in increments of 0.01 units per hour, which gives greater customisation than the 0.25 units on my late Animas. The biggest challenge for me is that they can only be set on the hour, rather than the half hour. So when I wake up at 6.30am, I can only set my elevated waking basal rate to run from either 5am or 6am, rather than my ideal time of 5.30am. I’ve been experimenting with some basal tweaks this week, and hopefully I’ll be able to work around this. I’m also liking the vibrating reminders when my temporary basal rate is finished running. I tend to sleep over middle of the night alarms, but the pump has even woken me up during the night to let me know a temporary basal rate has finished running. It’s a really handy feature to have, reminding me to check my blood sugar and evaluate whether I need to run it for longer. 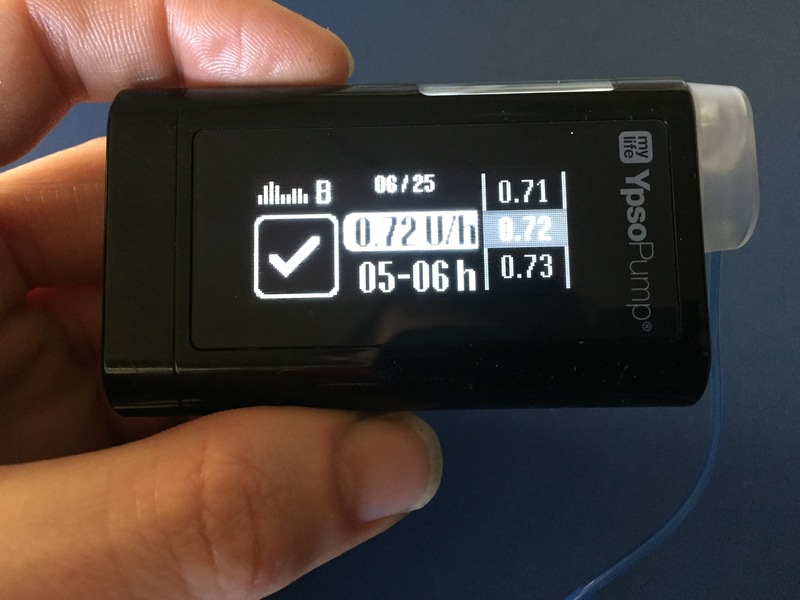 The biggest difference to my late Animas is that the YpsoPump does not contain a bolus calculator. That is contained in the companion mylife smartphone app. Or any other bolus calculating app, for that matter. 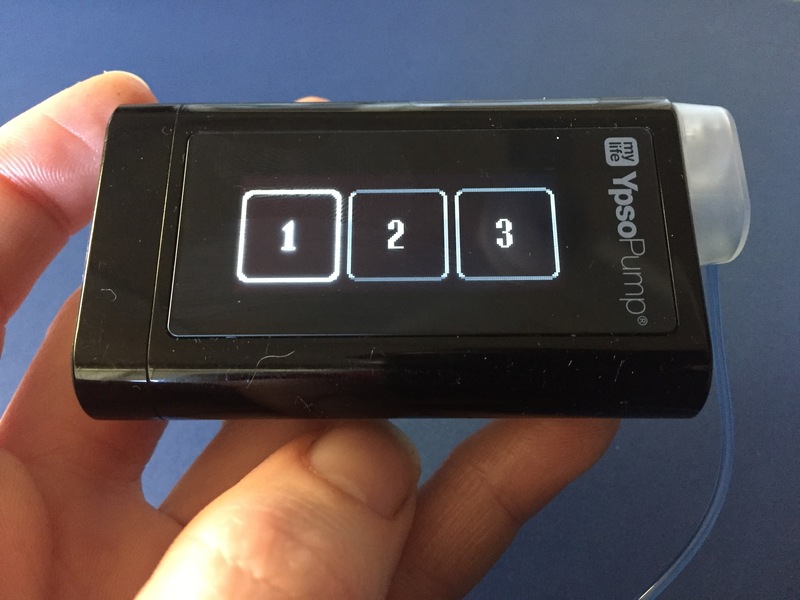 So you would need to open your app, work out your bolus, and enter that number into your pump. 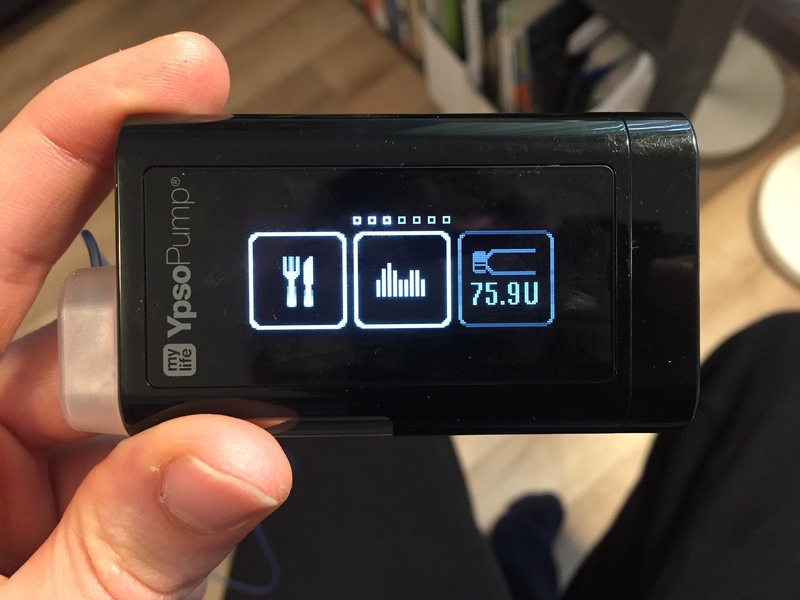 The app then syncs with the pump via Bluetooth to obtain insulin data. At the launch event, we were told that the pump could eventually be controlled from the app. I have no problem using a phone app to calculate insulin boluses. I’ve done it before when I’ve taken pump breaks. But I found it frustrating having to wait a good 15 seconds for the app to sync with my pump so that I could do a bolus calculation. I’m so used to being able to quickly glance at my insulin on board during the day before various activities. Not to mention that having my Bluetooth constantly switched on is a drain on both my pump and iPhone battery. As a result, I must say that I’ve been slacking off on bolus calculations. I expressed to the rep last week that it would be helpful if the bolus calculator worked independently of having to sync with the pump. After suggesting that I could switch my insulin therapy settings to Multiple Daily Injections, I’ve been able to do just that. So long as I’m logging all of my bolus calculations and insulin doses in the app, I’ll be able to see my insulin on board without having to sync the pump via Bluetooth. 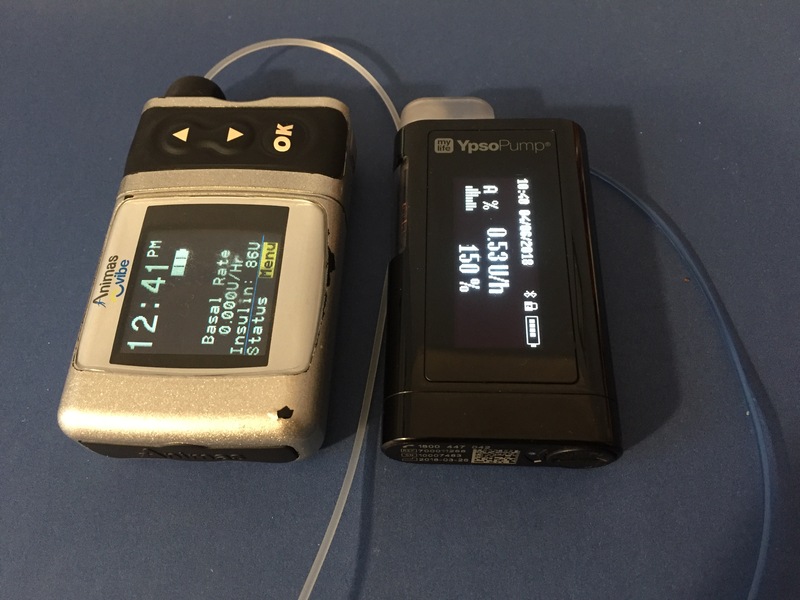 The pump can deliver insulin boluses in increments of 0.1 units, which is slightly less than the 0.05 my late Animas allowed. 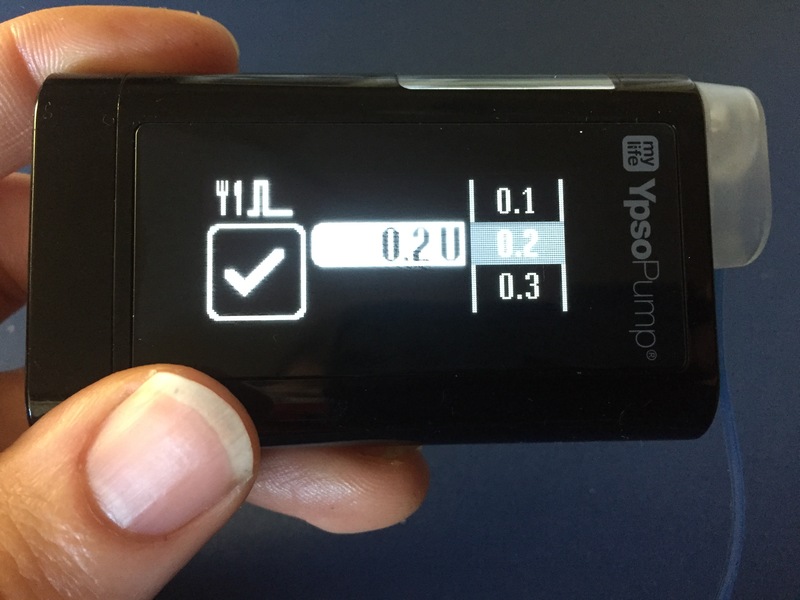 The bolus calculator automatically subtracts insulin on board from a bolus calculation, which might not always be necessary. It also lacks the flexibility to make adjustments to insulin to carb ratios or insulin sensitivity factors for things like physical activity. However, it is working a lot better for me in MDI mode. I know just how hard a good bolus calculator is to find, and for me a diabetes app without one simply has no value. 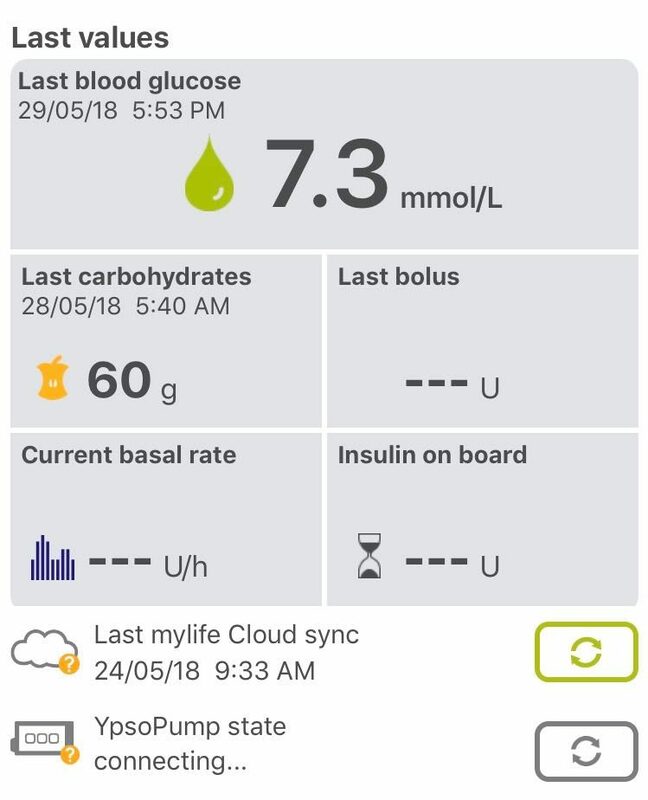 Ypsomed do appear to see the bigger picture of people who don’t use pumps and CGMs, and I’m confident that the company is working hard to make Multiple Daily Injections and glucose monitoring ‘smarter’ as well. 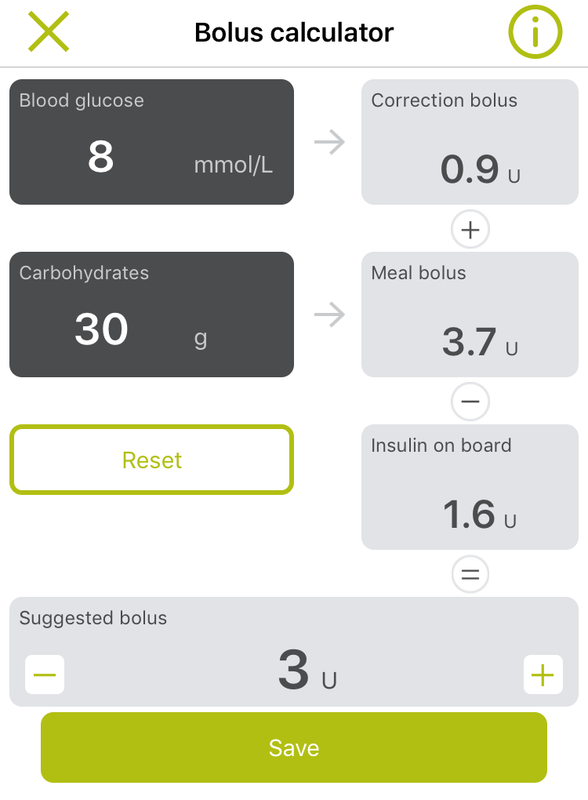 If you are looking for a bolus calculator, you can search for the ‘mylife app’ in your Google Play or App Store. Come back tomorrow for part two of my review of the YpsoPump! Updated: Find part 2 here! This is very interesting. I was put in a late trial for the Medtronic 670G pump. A big mistake. We found out that the 0.250 unit per hour was not low enough, The lower basal rate this one delivers may work better if we can get it here in the states. I’ll look into that. I do have to say, after my last TWO attempts of using the pump, I am not a fan at all of how they worked with me. I still feel the doctors are missing the fact that my metabolism may be at fault with all this. Quick to rise and just as fast to fall after exercise. I can tell you even before I go mow the yard that I need to eat first as it will crash before I’m done. I’ve had it drop 131 points in 1 hour. Doctor gets mad when I bolus at 90 instead of waiting until its down to 70s or 60s. No way am I going to let it get that low with that fast of a drop. Thanks for the info on this pump. I’ve never heard of it but I will keep a look out for it now. Thanks for reading! I think you mean 0.025 units per hour? I’ve just checked, the YpsoPump will go as low as 0.02 units per hour – so only slightly less. Oh that is more of a screen than it looked like. Cool beans.